Every recipe has a history. This one is not only fascinating, but led me to the discovery of two amazing women. When I first came across Joe Froggers in the box, I had no idea what they were. So I conducted a little internet research. What I found left me wanting to buy two plane tickets: one to Marblehead, Massachusetts to visit the birthplace of this cookie and pay homage to its creator; and the second to Manhattan, Kansas to visit Kansas State University, which houses the archives of a woman who changed the way America wrote about food. Throughout my research, I found several variations of the Joe Frogger story. From what put together, I believe this to be the most accurate version. The first batch of Joe Froggers came out of the oven in the late 1700s. They were the invention of a woman named Lucretia Brown, or “Aunty ‘Crese”. She named the cookie partly for her husband, Joe Brown, or “Black Joe,” and partly for the frogs that inhabited the pond behind their home on top of Gingerbread Hill in Marblehead, Massachusetts. Perhaps their home was also an inspiration for the cookies because they are very similar to a gingerbread cookie. Black Joe was a former slave who served in the Revolutionary War and, after the slaves were freed, bought property in Marblehead where he established his home and eventually opened a tavern. Joe and Lucretia were well known for the raucous parties that occurred at Black Joe’s Tavern. The constant thunder of heels clapping floorboards as guests danced the jig while Joe played the fiddle was typical at the tavern no matter what time of year, as was the copious consumption of alcohol. Lucretia’s Joe Froggers became a legend of their own in the area. These cookies were called the “never-stale cookie” and for this reason were popular on sea voyages and fishing trips. I never had a chance to test this theory because the cookies were so popular at the cookie exchange and at family gatherings where they made an appearance that there were never any leftovers. 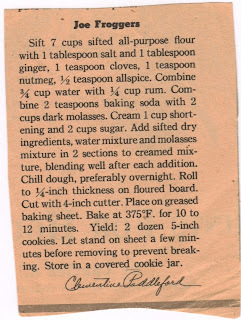 Please note: if you do try this recipe, it makes A LOT of cookies and requires a pretty strong mixer. I imagine that Lucretia had amazing arm muscles from stirring batch after batch of this extremely viscous batter. It nearly broke my little hand mixer! Black Joe’s Tavern still stands in Marblehead. In fact, Joe’s fiddle still hangs on the wall. He has a large headstone at his resting place on Gingerbread Hill. The town has honored him several times and if you search his name on the internet, thousands of pages come up. Lucretia, however, is another story. Her grave is unknown and the internet barely mentions her name. But she does make an appearance in Anya Seyton’s book The Hearth and the Eagle. I felt a connection between Lucretia and the Found Recipe Box – both were the bearers of heartfelt kitchen creations, but after their time had passed; they were left to fade away like a love note scratched in the sand before high tide. I found it fitting that I discovered Lucretia during my journey through the Found Recipe Box and am happy to be able to honor her memory on this blog. She may have slipped off the history pages during her own lifetime, but it’s a privilege to etch a place for her in mine. I think everyone dreams of doing something with their life that will be remembered after their passing and I’m sure she would love to know that her cookies are still being made with her in mind. Someday I’ll make a stop in Marblehead to properly honor Lucretia. Since her gravesite is unknown, I’ll place a Joe Frogger outside her kitchen window where it will always remain fresh and flavorful, just like my memory of an inspirational woman I never met. I actually started writing this post awhile ago, but felt like something was missing. It just didn’t feel finished. For inspiration, I held the yellowed paper of the recipe in my hands and noticed something I had overlooked before. I did some more research and was introduced to yet another truly remarkable woman. She deserves much more than a simple name drop though; she deserves a post of her own. So please check back to learn about the woman who Time magazine named America’s “best-known food editor” in 1953. Loved this story! Sounds like a cookie I must bake. Great story! You will have to hurry & finish part 2. We looked Marblehead up on the map and my hubby said it's very pretty there. Made these today, except I cut down the recipe in fourths. Still made 3 dozen. Also I rolled the dough into balls, then sugar and flattened with a glass. Reminds me of ginger snaps. Great to dunk in coffee! Lucretia (Thomas) Brown died in Marblehead, MA, 21 May 1857, aged eighty-three years and eight months. She was buried on Old Burial Hill in Marblehead. This information can be read on her gravestone there. I ALWAYS baked Joe Froggers for my kids throughout their entire childhood. And I'd always make sure to have enough to send home with our Friday night dinner guests. I'd send them home with enough to last a week, but they often confided that the cookies never lasted long enough to see Sunday morning. I always used the recipe found in my tattered 40+ year old Fannie Farmer cookbook. All my best and most popular recipes came from that book. I use the Better Homes and Gardens version of this cookie. It is a favorite of my son and brother. It is also vegan! I always double the recipe and it does take a strong mixer! My mom used to send these to my brother when he was in the navy...not at all fragile, especially when put in tins and packed in real popped popcorn! Thank you for your research on the Joe Frogger and Marblehead--two of my favorite subjects! I was born in Marblehead and lived there only until I was 10 years old--but, oh, the memories of these wonderful cookies being sold in all the small shops....they were thick, rectangular bars with sugar on top and plump raisins inside. I now live in Fredericksburg, Virginia. At Christmastime, the Rising Sun Tavern, once owned by George Washington's brother, is decorated in period finery, with festive punch and cookies offered to all visitors. One year, the treat was Joe Froggers. They were thin, crispy ginger rounds--served with a thin slice of cheddar cheese! Lovely, true....but don't you know I lagged behind to set the sweet Southern ladies straight--these cookies were born in Marblehead, Massachusetts, and we Yankees never eat them with cheese! 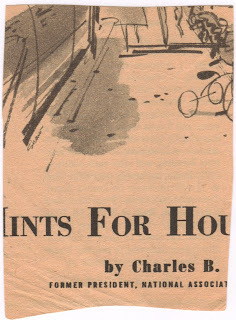 My recipe comes from the 1963 Betty Crocker Cooky Book, now in original reproduction print. Visit Marblehead if you can--it is the same town today it was when I was a child--quaint, innocent, absolutely beautiful. I think this is very interesting and I'm anxious to try a few of these recipes. I've made Joe Froggers before but look forward to trying this one. Thanks for doing this.